The abducens nerve is a nerve that controls the movement of the lateral rectus muscle in humans, responsible for outward gaze. It is also known as the abducent nerve, the sixth cranial nerve, sixth nerve, or simply CNVI. It is a somatic efferent nerve. The abducens nerve leaves the brainstem at the junction of the pons and the medulla, medial to the facial nerve. It runs upwards and forwards from this position to reach the eye. The abducens nerve supplies the lateral rectus muscle of the human eye. This muscle is responsible for outward gaze. The abducens nerve carries axons of type GSE, general somatic efferent. Limitation of abduction of the right eye. This individual tries to look to his right, but the right eye fails to turn to the side. Damage to the peripheral part of the abducens nerve will cause double vision (diplopia), due to the unopposed muscle tone of the medial rectus muscle. The affected eye is pulled to look towards the midline. In order to see without double vision, patients will rotate their heads so that both eyes are toward the temple. Partial damage to the abducens nerve causes weak or incomplete abduction of the affected eye. The diplopia is worse on attempts at looking laterally. 15–40% of people with tuberculosis have some resulting cranial nerve deficit. The sixth nerve is the most commonly affected cranial nerve in immunocompetent people with tuberculosis. 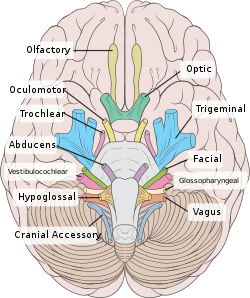 The Latin name for the sixth cranial nerve is "nervus abducens". The Terminologia Anatomica officially recognizes two different English translations: "abducent nerve" and "abducens nerve". ^ a b c Gray's 2008, pp. 666-7. ^ "Halo Orthosis Immobilization - Spine - Orthobullets". www.orthobullets.com. Victor, M, Ropper, AH. Adam's and Victor's Principles of Neurology, 7th ed. McGraw-Hill, 2001. This page was last edited on 3 February 2019, at 18:41 (UTC).